Kick off your holiday season with a concert centered around the much-loved poem ‘Twas the Night Before Christmas. 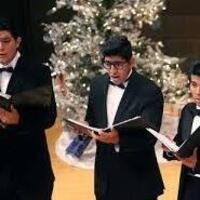 Featuring the UTEP Men and Women’s Glee Clubs, Concert Chorale and Chamber Singers along with the UTEP Ceremonial Brass and other guest artists, over 120 student musicians will fill the stage for one of the most popular offerings at UTEP’s Department of Music. Music will include much-loved holiday favorites from around the world, as well as new choral compositions sure to inspire. Arrive early! Refreshments and special music will be available in the Fox Fine Arts Recital Hall lobby starting at 6:30 p.m. before the show. Tickets available at UTEP University Ticket Centers, TicketMaster.com or at the door.